The Jelly Belly factory is a magical place. 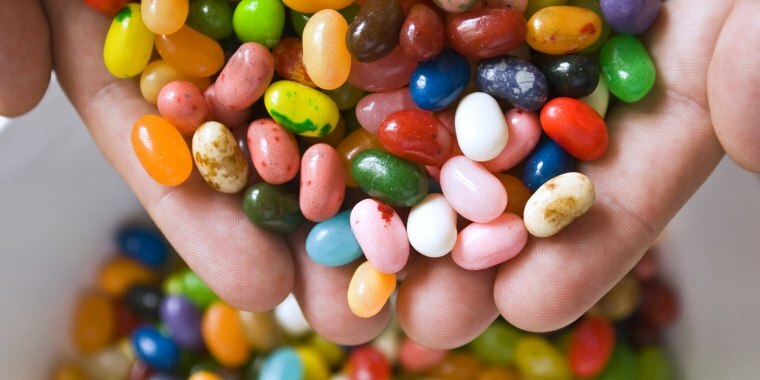 Think rainbows of sweetness, seas of beans, an ever-flowing procurement of more than 100 flavors and 100,000 pounds produced for the world every single day. With the onset of spring and decorated Easter baskets coming to fruition, Tutti Frutti, Juicy Pear, Buttered Popcorn and America's favorite Jelly Belly flavors fly off shelves. But how are these lovable, sometimes unlovable (booger comes to mind) and confusing (beer comes to mind) candies actually made? NBC News correspondent Joe Fryer went to Fairfield, California and suited up in a hairnet and uniform to discover just what happens in the Jelly Belly Factory with Will Wonka himself. (Just kidding.) The actual CEO of Jelly Belly is Lisa Brasher, the fifth-generation owner of her family-run business. "It takes 7 to 10 days to make one bean," Brasher said. "There'll be people that come. And they think you just stamp the bean out of some gooey candy mix and that's it. And they have no idea what it actually takes, and what an art form it is to make a jelly bean." The process of Jelly Belly-making begins with a hot liquid candy that gets flavoring and coloring added to make the beans distinct. The hot liquid then gets pumped into molds where they're carted into a dry room overnight. The dry room acts as an oven to help the molds firm up. After a good night spent solidifying, the molds are sent by a conveyor-belt that leads them to a steam bath and sugar shower. "How cool is a sugar shower?" Joe asked Brasher. "I know, it's kinda like a spa — a jelly bean spa, you know? Steam bath, sugar shower," Brasher said. Once the jelly beans have been properly pampered, they get their shells, a process Brasher calls "the art of making candy." Vessels like cement mixers spin hundreds of pounds of beans as confectioners pour pitchers of syrup and sugar into the mix. Gradually, the shells build up. "We like to say they have to use all their senses. They look at the beans and how they're tumbling in there. They listen. They can actually tell when the beans are done by how they sound in there." When the beans have been coated, dried and polished, the final step is to brand them with the iconic Jelly Belly logo. Who knew so much work went it to making such a small bean.